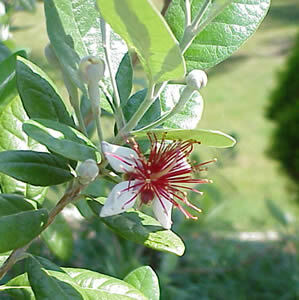 Feijoa sellowiana is a bushy shrub with elliptic-oblong, gray green leaves with a silver underside. Actually, with pruning, Pineapple Guava can be trained into a single stemmed small tree or pruned as a hedge. The petals on the flowers are red with white underneath and have very obvious red stamens. The tangy flavored, oblong fruit is produced after long hot summers and can be eaten raw or in jellies and jams.